Six years after the formation of the new international car brand, Qoros reached the biggest milestone in its history so far, as it handed over its first customer car. 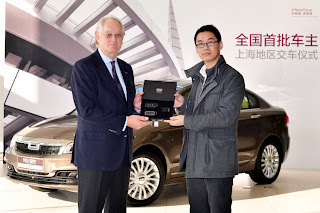 from Shanghai, was handed the keys to his brand new Qoros 3 Sedan by Volker Steinwascher, Vice-Chairman of Qoros. The car being handed over is an Elegance model in macadamia brown. "I'm thrilled to be the first customer in China to take ownership of a Qoros 3 Sedan. As a designer, I like its elegant styling, the spacious interior, its refinement, and the QorosQloud connected services, which will make the car part of my digital life. Moreover, it's reassuring to know the car is safe, having been awarded the five-star rating by Euro NCAP," said Yu Min. "I chose a Qoros 3 Sedan because I like to try something new and understand that it stands for a brand doing things differently. Qoros may be new but its products are exceptionally well-engineered and well-built. The purchase experience was also very refreshing, with a modern, innovative dealership and highly attentive staff who provided an excellent service. It is taking an innovative approach that I have never seen from a car brand before," he further added. Volker Steinwascher said, "I'd like to congratulate Mr. Yu Min on his purchase and for being the very first customer in China to take delivery. Qoros has worked hard over the last six years to develop stylish, innovative cars to European standards of safety and quality and that define a New Premium." "To realise our aim of appealing to our target audience of modern metropolitan, 'always-connected' customers is very satisfying. Handing over our very first customer car in China is an immensely proud day for me and everyone in the company, and one we will remember for a very long time."